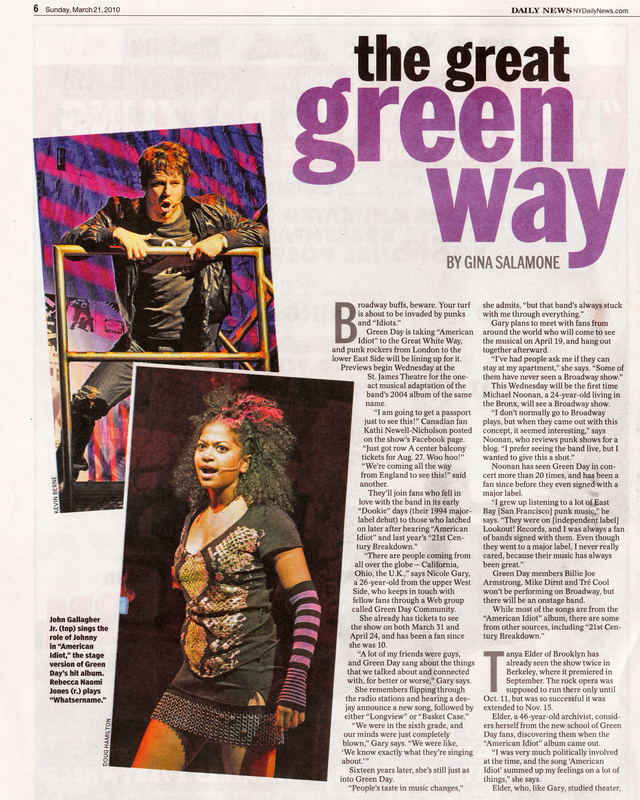 A little over five years after Green Day’s American Idiot hit the music world gobsmacked in the face with a new sound from the band and a fierce story of suburbia, despair, longing, and American teenage angst, the Broadway version of the show is about to take the Great Green Way by storm in 24 hours with its first preview on March 24, 2010. 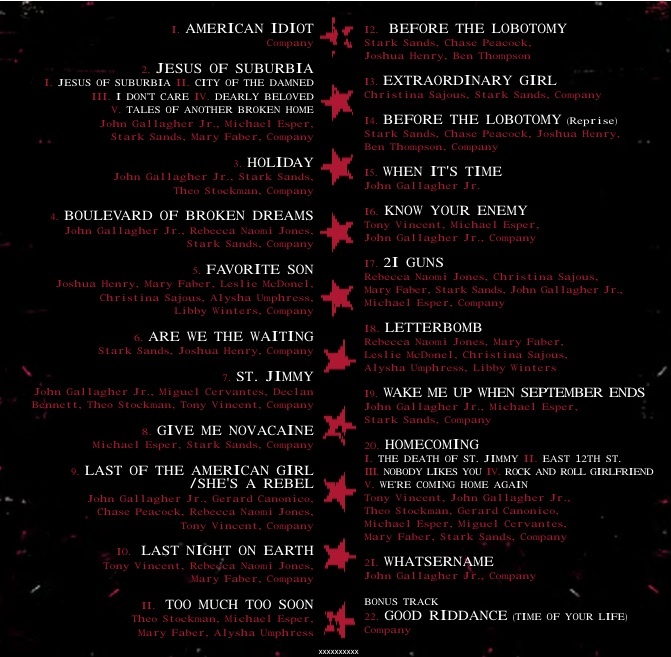 Yes, you heard me correctly, American Idiot, an album made by those “snotty punks” from the 1990s is going Broadway, baby, and if word on the street is correct, it’ll be a movie as well, as rumors (leaked yesterday and timed quite well, I might add…) are swirling around stating that Tom Hanks’ Playtone production company is in talks with the boys to take it to the big screen. And that’s the place where Billie Joe, Mike and Tre wanted it to be in the first place. I have a feeling it’s going to happen. Theo Stockman posted this 1993 interview with the boys on his Facebook page the other day. If you want to see some eerie foreshadowing, take a look at this hilarious interview where Tre mentions that “Green Day rock opera available on very small records!” and Mike talks about calling it “Jimmy.” Say what you will, but these boys knew their destiny a long time ago. But man, are they so young looking in this clip and yes… dare I say it… stoned! LOL. Today, Tuesday, March 23rd, is the final dress rehearsal, which happens tonight. That means that invited guests will be attending the show as if it’s going up from start to finish, unless some technical snafu gets in the way and they have to work it out during the production. Final dress, however, is usually conducted from start to finish and then the cast may sit down for a slew of notes from the director. Prior to that however, the boys and the production will be holding a press conference for 500 or so lucky fans (LIKE ME!!!) today at the St. James. We’ll be heading into the theater at around noon today and from what I understand, Billie Joe will introduce director Michael Mayer who will then introduce the cast. Afterward, the cast will sing a few songs from the show and the press will go off and post their commentary in time for the papers tomorrow and the entertainment news shows tonight. I was very lucky this past weekend to be featured in the New York Daily News with two other fans that I know, the crazy but sweet Mike Chickenman (you may remember him as the hardhat guy from MSG1 back in July) and Nicole Gary. We did a photo shoot at the theater a few weeks ago and then were interviewed by Gina Salamone of the Daily News. Unfortunately, the NYDN hasn’t put it on their website (they are never known for being a smart publication as they would have gotten a crap load of hits if they had), but luckily it was scanned very professionally by Nicole’s husband, and you can read it below. In the meantime, I can’t imagine what is going through Billie Joe’s mind right now. All I have to say, is breathe, man. You are going to take Broadway by storm. 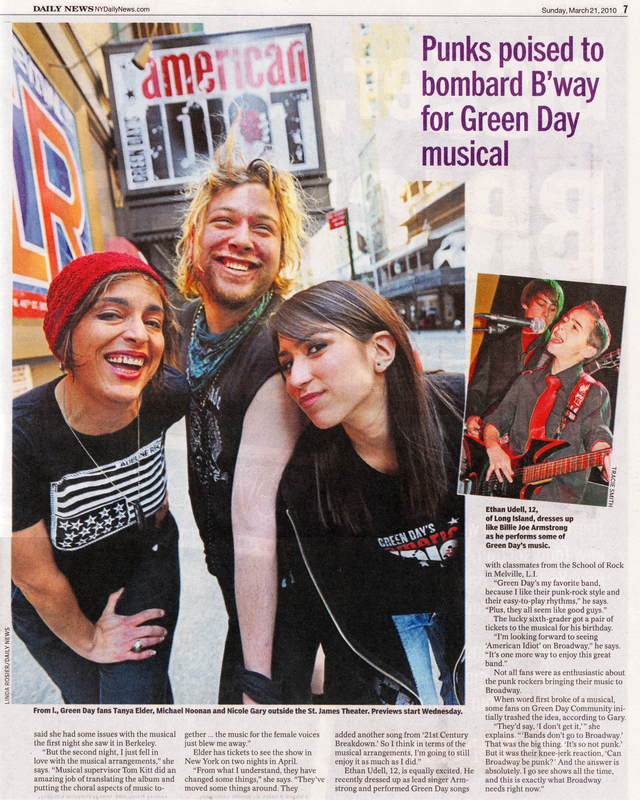 This entry was posted on Tuesday, March 23rd, 2010 at 8:00 am	and tagged with American Idiot on Broadway and posted in Green Day's American Idiot (Musical). You can follow any responses to this entry through the RSS 2.0 feed. that video is too adorable…those little little boys! warner and coke or columbia and heroin? we chose warner. thanks for posting that video tanya. Yes, it was only for a 1/2 hour, it was over about 12:30. And yes, I hear that they are at Sardis. Whether they are still there, I don’t, of course, know. Good luck.